Disney Big figures may have been born out of customers interest in the Disney Store's decorations. Statues of Mickey, Minnie and Donald were often seen in each store at the time. 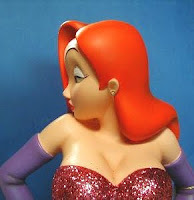 Some time into the Millennium, Disney parks began creating Big Figures - very large format sized statues. 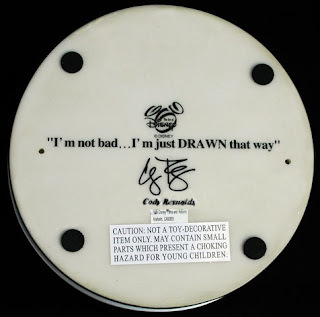 They soon became a big hit. 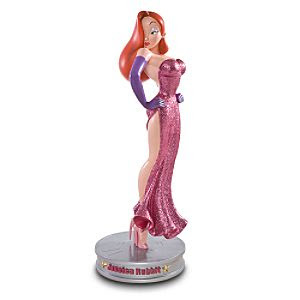 In 2005, Disney finally offered up a stunning Jessica Rabbit Big Figure, featuring glitter, jewel earring, and display base. 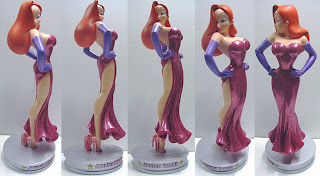 The Jessica Rabbit Big Figure is stunning from every direction and offers a lot of dangerous curves. This was the first Jessica Big Figure released (the other was Jessica and Roger offered on Disney Shopping) and for a long time was only available in Disney Parks but had recently shown up on DisneyStore.com. While the Roger and Jessica Big Figure was a limited edition, this figure of Jessica alone is an open edition - so it should give you plenty of time to save up and get one for about $150. Jessica's face is a little off. The nose is a bit too big, but it's really the only thing out of the whole statue that is out of place. 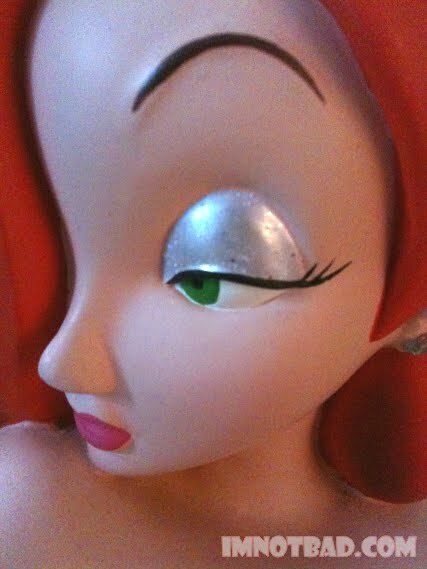 Jessica has some glitter on her eyelid, giving her makeup an extra touch. Some people complained that the paint is not totally even, leaving some sloppy lines. This is mostly true around her hairline, although it's pretty well done everywhere else. The jewel earring is another plus and feels very secure in place. There was no holding back on sculpting her bust this time around. The dress comes up to about the correct height and she's as ample as she needs to be. There are lots of shadows painted onto the statue - such as on her hair, gloves, legs and bust - which gives it a heightened dimensional look. There is a ton of glitter on this statue. A Ton! Attached to one arm when you open the figure is a tag stating that you should handle the head and feet of the statue more than the glitter areas, in an effort to keep the glitter from coming off. Does it come off? Oh yes. 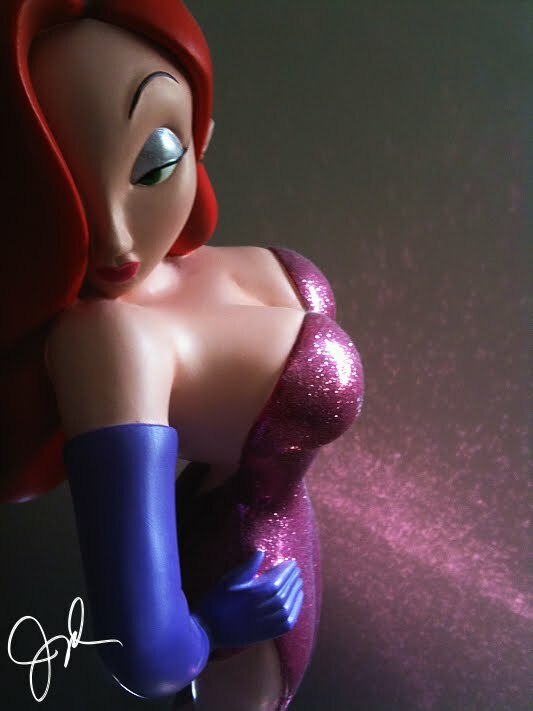 I find it on my hands, on the floor, on my pillow (don't ask me how it got there) and there is a lot of stray glitter when you open the box both in it and on the figure itself. The Big Figure comes with a special display base. 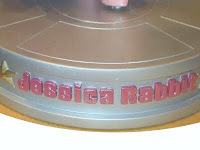 It's a silver film reel with "Jessica Rabbit" in pink around the front and two gold stars on either side. It's quite a heavy base, maybe even heavier than the figure itself. 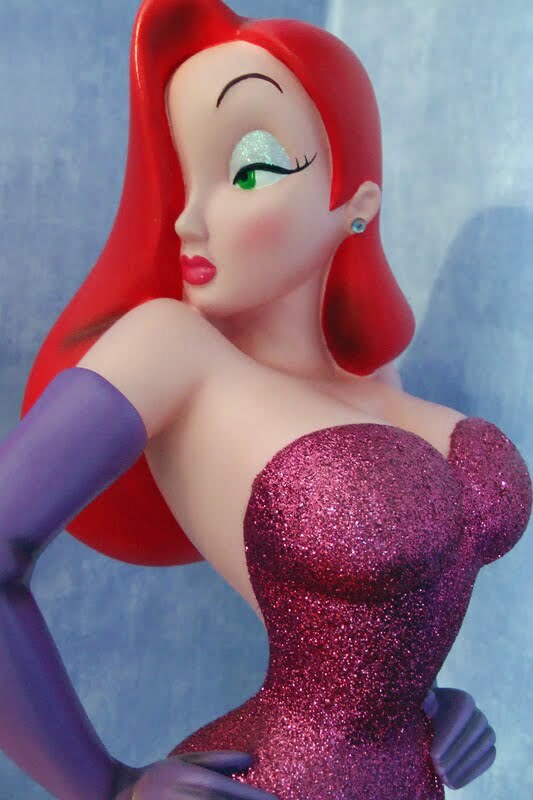 Looking at the bottom there is some further information about it, such as the title and a printed signature of the artist, Cody Reynolds - who also sculpted other Jessica Rabbit merchandise such as the 2000 Jinglin' Jessica Christmas Ornament. You have to be a little careful when putting Jessica on the base. Her feet are very small and have two holes on the bottom, lined with a thin material. I'm not sure just what is in there to keep this sturdy enough, but it must be some sort of metal. 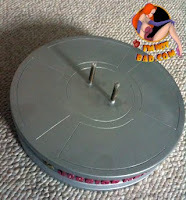 You insert the two prongs from the base into Jessica's feet (after you take the protective plastic off the prongs) and she should stand up with ease. When you see her standing on the base, this Big Figure appears to defy gravity as only Jessica can. A big complaint, and a possible problem, is that the statues seems to lean a bit to the right. Some statues tend to lean more than others I have noticed in photos, and I'm not sure if this was a problem later corrected by Disney, or if some statues are leaning more over time. 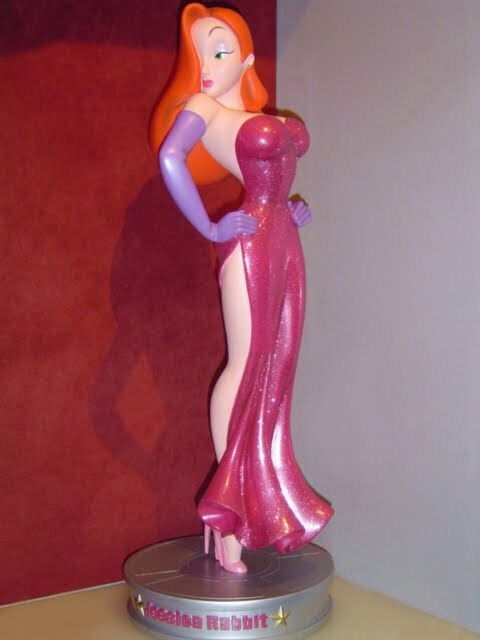 I ordered my statue when it came out from The Art of Disney store in the Disney Market Place in Florida. I was a bit concerned about the shipping cost but the cast member assured me that since Jessica was so slim, the figure would not be that much to ship. When it finally arrived, it looked great - until I did a further examination. The statue was broken! There was a crack going around the entire waist, one around the right forearm and another on the left wrist. I was sorely disappointed about this and had to call Disney right away. I told them what happened and they did send out a replacement which looked fine. One possible issue is the box that they send it to you in. It's just the big cardboard box itself, with the figure encased in styrofoam and wrapped inside there - so this is definitely a fragile ship - although the broken figure I got was so damaged that I think this had to have happened before shipping somehow. 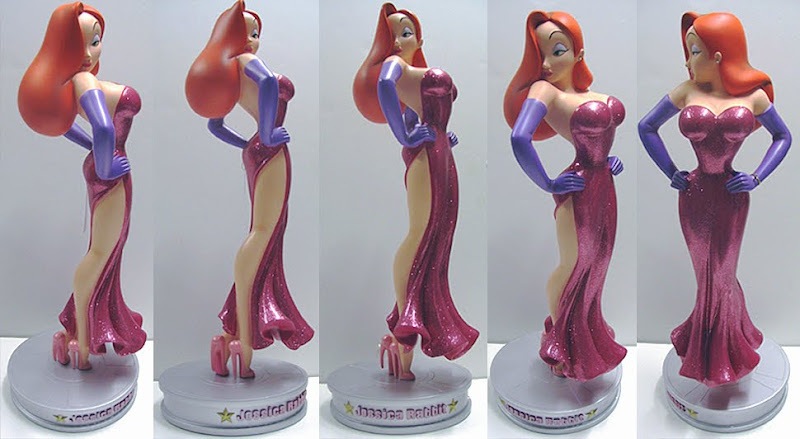 The Jessica Rabbit Big Figure gets a 3½. 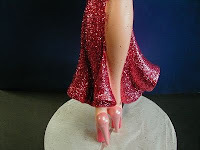 It's a nice figure, but over time, a lot of the glitter is going to come off. That coupled with a leaning pose, some sloppy lines and an off model face bring the score a little lower.